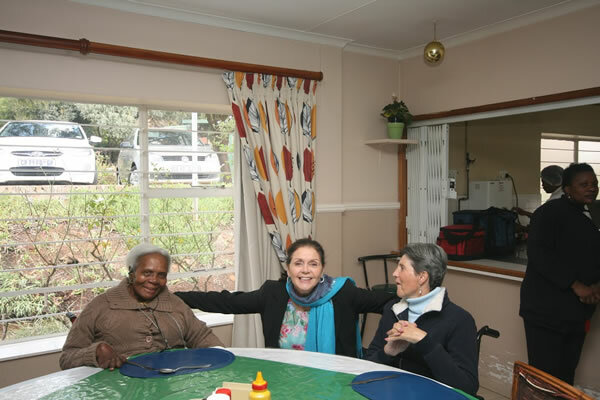 What a super Madiba day we had at Ann Harding Cheshire Home in Northwold! For 7 years our Randburg branch has been involved with the residents and management ongoingly, be it for Valentines Day, over Easter and Christmas or Casual Day. They have truly become family to us. Yesterday we were privileged to be able to provide toiletries and dish up and serve delicious pudding to all our friends. It was great to do catch up on what was happening in everyone’s lives. The Thrift Shop, which we support well, was unfortunately closed, being a Monday and sadly we could not chat to the many volunteers who do a sterling job of sorting, pricing and selling goods donated. Being winter our visit took us from the dining room to the sunny patio where we were all soaking up the sun and chatting about their bingo sessions, art classes and just having a good laugh. As always, a great day with friends who never cease to motivate us and continue to enrich our lives.